Euphemia li Britannia (ユーフェミア リ ブリタニア, Yūfemia ri Buritania), 16 years old, was the Third Princess of the Britannian Imperial Family. Euphemia is Lelouch vi Britannia's half-sister and the sister he cared most about after Nunnally. Euphemia was the Sub-Viceroy of Area 11, a role she admittedly did not enjoy. Euphemia admired her older sister, Cornelia, but despised all combat in general, though was capable of piloting a Knightmare Frame. Euphemia is said to be very beautiful. She has pink hair that is usually styled downwards with two buns on each side of her head. She is taller than average height being slightly shorter than Lelouch and Suzaku. She is usually seen wearing a pink and white dress with a rose choker. Though she is a member of the Britannian royal family, she remains kind-hearted and open-minded to everyone around her and treats everyone with respect even if they are not Britannian; this universal respect probably stems from her own childhood experiences with her siblings Lelouch and Nunnally whose mother wasn't from the nobility and thus were looked upon with disdain by the other members of the Britannian Imperial Family. She is the second person in the Imperial Family to discover that Lelouch is alive and first to know his alter ego as Zero, having deduced it after the hotel hijacking incident. In her childhood, she was quite close to Lelouch and Nunnally. She develops a close, romantic bond with Suzaku Kururugi because of their shared belief that a problem must be changed from within. Euphemia is introduced in the fifth episode, where she jumps from her window several stories above the ground and lands in Suzaku Kururugi's arms. They spend the day in Area 11 and Euphemia goes under the name Euphie, which becomes the nickname that Suzaku and Imperial Family call her by. They become friends quickly and Euphemia, after revealing her identity as the Third Princess of Britannia, asks that he help her prevent any unnecessary deaths. She attends Prince Clovis' funeral and hears the Emperor of Britannia, her father, makes a speech on the virtues of inequality and the social battle for evolution and betterment. When she is taken hostage along with a group of tourists by the Japan Liberation Front at the Lake Kawaguchi Convention Center Hotel, Euphemia attempts to use her position to free the other hostages. Lelouch, in his Zero persona, has incidentally led the Black Knights to the same location, and the two meet. Lelouch remarks that Euphemia had not changed since childhood and was not surprised to see her act in such a manner. Though he brandishes a gun at her, he decides against killing her. Euphemia makes Suzaku her knight. Concerned about Euphemia's safety, Cornelia persuades her younger sister to select a Knight to protect her. After resolving the conflict between her own ideals and Cornelia's advice, Euphemia chooses Suzaku Kururugi. Cornelia worries that Euphemia's ideals will get her sister into trouble and warns Euphemia that the policy of discrimination against Honorary Britannians like Suzaku is so firmly established that she might have to be exposed to the rigours and dangers of competing for the throne in order to challenge it and that it is better if Euphemia were to be the Empress to change such policy. Regardless, Euphemia adamantly sticks to her decision and Suzaku remains her Knight until he voluntarily steps down after he is arrested for deserting the front lines during a battle against Zero. Euphemia goes into a state of depression as she feels she is useless and the blow of Suzaku leaving her but an encounter with Nina allows her to discover that she has developed feelings for Suzaku. Suzaku at that moment goes into battle with a new prototype that is connected to Lancelot. His energy levels drop and Euphemia makes a transmission and declares that she orders him to love her and in return she will love every bit of him. Suzaku reciprocates the feelings and declares his love for her. Euphemia then convinces him to rejoin her as her knight. Euphemia laying with her sister, Cornelia at the Viceroy Palace. In the immediate aftermath of the Battle at Shikine Island Base, Euphemia encounters Zero when the two of them are stranded on a nearby island. Having deduced Lelouch's identity from their earlier meeting, she convinces him to unmask, promising to keep his alter ego a secret. She goes to Ashford Academy during the school festival just to see Suzaku. The incident allows her to unexpectedly reconnect with Lelouch and Nunnally as she secretly visits them at the Ashford Academy during the school festival. Euphie and Nunnally spent time having a good conversation about old times and Nunnally tells Euphie to promise to keep both her's and Lelouch's royalty a secret. She and Nunnally visit Lelouch and with the three of them interacting privately, Lelouch tells Euphie that this is the last time that they will see each other. Euphie says that she has never been this happy before. When the media catches her visiting the school, Euphemia makes a surprising announcement. Wishing to live the peaceful days she once had with Nunnally and Lelouch, she declares the establishment of the Special Administrative Zone of Japan for the Japanese people. This runs completely contrary to Lelouch's plans. Though met with disapproval from other government officials, her plans go forth with the help of her older brother Schneizel el Britannia, who apparently supports her idea and promises to inform Cornelia of it. Lelouch uses Geass on Euphemia. Lelouch, when he meets her as Zero, reveals his opposition, but becomes convinced of her conviction when she reveals she is doing it for the sake of Nunnally and has abdicated her right to succeed the Britannian throne. Upon agreeing to Euphemia's proposal, Lelouch goes off on another conversation with Euphemia, eventually saying that if he really wanted to, he could get her to do anything he asked for, and he jokingly mentions the genocide of the Japanese people as an extreme example. Unknown to him, minutes ago he had lost his ability to turn his Geass off, and it conveys the order to Euphemia. Euphemia killing the Japanese while under the influence of Lelouch's Geass ability. Euphemia initially tries to resist the order and briefly succeeds, but is soon overtaken by its power. Under its influence, she leads the Britannian army to massacre countless innocent people. Trying to hide the unforgivable crime he made, Lelouch made all Elevens and the Order of the Black Knights believe that Euphemia betrayed them, that she just thought of the Administrative Zone of Japan a laugh and made fun of all Japanese. Lelouch then ordered to stop Euphemia from the massacre of all Japanese and quoted: "Stop the Britannians! Save the Japanese!" He suddenly becomes teary-eyed as he ordered, "...and kill Euphemia!" Lelouch, with much regret, fatally shoots her in the stomach to end her rampage while revealing that he considered Euphemia his first love. He nevertheless takes advantage of the chaos, rallying the angry Japanese populace into a massive army and leading it against the Britannian forces. Euphemia's body is recovered by Suzaku and she spends her final moments with him. The command to kill him, as he is of Japanese descent, tries to take hold, but she resists it, either because she cares for him too much or is simply incapable of carrying it out. As she is unaware of what she did and asks if she made the right decision, Suzaku decides to lie and tells her that the Japanese were happy with the Japan she created. She cries with joy telling him that she is glad it worked out. Suddenly she can't see his face anymore and both of them begin to cry. Realizing she has little time Euphemia urges Suzaku to stay in school for both of them and dies smiling telling him how glad she is. Her death creates a firm resolve in both Suzaku and Cornelia to defeat Zero. Lelouch is also deeply affected by Euphemia's death and resolves to fight and defeat Britannia once and for all. In supplementary materials, it is revealed that Britannia officially declared Euphemia responsible for the massacre and that she had been deprived of royal status and executed by the Britannian Army; aside from this false declaration, Britannia refused to make any other compensation for the Japanese, instead they increased the level of discrimination; to the point where the Britannian mafia was able to freely do human trafficking and other illegal activities on the Japanese. "Citizens of Japan" are reverted back to the name Elevens, and a number of initially restored rights and privileges are again denied to Elevens. After the incident, the Japanese general public in Area 11 refers to her as the "Massacre Princess". Euphemia's death impacts and influences the actions of several characters. Suzaku becomes emotionally unstable and pursues Zero, having discovered Zero's true identity. Once he believes Zero has been eliminated, Suzaku continues to serve the Britannian Empire. His actions remain motivated by his memory of Euphemia; he refers to her as an "irreplaceable woman" when he speaks to Lelouch on the rooftop of Ashford Academy and carries around Euphemia's quill pen as a memento. The Lancelot's right wrist was adorned with an emblem that honors Euphemia's memory during the EU Campaign in Code Geass: Akito the Exiled which served as a motivation for him to conquer E.U. with the aid of his worst enemy Julius Kingsley. Suzaku drastically changes his personality as he no longer cares for the lives of the people in order to achieve his goals such as selling his friends out for the Knight Of Rounds position and killing anybody who gets in his way which nicknamed him the "White Reaper." Suzaku's goal during this time was to become the Knight Of One in order to take control of Japan so that people will no longer support Zero. Cornelia abandoned her position as Viceroy of Area 11 in order to clear her name. She made attempts to track down the source of Geass with the aid of Orpheus Zevon and therefore she was able to avenge her by leading V.V. to his fate. Cornelia's attitude towards Lelouch hasn't changed in their last encounter due to him killing Euphie. It is unlikely that she does not know the truth due to her distrust of Lelouch but helped Schneizel clear her name. She continued to clear her name until Lelouch obscured it with Zero Requiem making her drop her quest. Marybelle Mel Britannia, later during the events of Code Geass: Oz the Reflection: O2 later succeeds her with the title "Massacre Princess", Lelouch on the other hand is still impacted by the event which forever changed his life. He continues to fight Britannia in the honor of her memory as oppose of changing within so that such event won't be repeated. This was shown at one time when Lelouch lit the candle at the SAZ Memorial implying that Suzaku and Nunnally suspect that it was him all along. In order to prevent another SAZ massacre, Lelouch had the entire participants exiled since Suzaku in his heart knew that Euphy and Nunnally wanted to forgive Zero. Such action alone wasn't enough to satisfy Suzaku but it did implant doubts that would later end up changing Suzaku's views on Lelouch which then fixed their friendship when Suzaku knew that Euphie never told him Lelouch was Zero. Euphemia's half-sister, Nunnally, with her installment as the new Viceroy of Area 11, chooses to continue Euphemia's ideal and reinstate the Special Administrative Zone of Japan. As she reveals this to Zero, unaware that he is Lelouch, he is visibly unnerved by how Nunnally's offer reminds him of Euphemia. In order to spare Nunnally the same fate as Euphemia, Lelouch has himself and the entire Order of the Black Knights exiled. Euphemia's name was ultimately cleared after The Black Knights learned about Lelouch's actions and the existence of Geass. However, Schneizel did not reveal the whole truth, implying that Lelouch had intentionally compelled her into causing the massacre. Once Lelouch becomes Emperor, he explains to Suzaku that he intends to shed enough blood to make the name of the Massacre Princess be forgotten. In this aspect, Lelouch succeeded; following the Zero Requiem, all hatred was focused on Lelouch and the past forgotten, including Euphemia's massacre. She changed from a scapegoat to a martyr, another victim of the "demon" Lelouch in his quest to become Emperor and rule the world. She confesses her feelings towards Suzaku and learns he loves her back. Their relationship causes a hindrance to Lelouch's plans since Lelouch intended to have Suzaku as Nunnally's guardian. In the light novel, it was noted that Lelouch has been noticing that Suzaku has been distant from him and Nunnally ever since he was appointed as Euphie's knight. Suzaku was emotionally crushed when Zero killed Euphemia. Before heading out to battle, Suzaku called Lelouch through Euphie's number and discussed their actions and both confessed as Suzaku is willing to kill anyone in his way towards his target and what Lelouch is doing is for Nunnally's sake. Therefore, throughout both seasons, he has gone through drastic changes and is willing to kill anyone or make them suffer to bring his ideals into fruition that will satisfy him. However Suzaku is still hesitant due to doubting his actions as to how he wasn't willing to execute his assassin until Anya took over. Suzaku pretty much didn't let go of the grief after Euphie's death. He is shown hating Lelouch, when it was revealed that he was Zero, and having the intent to kill him and to end his reign by the time he becomes the Knight of One. Ultimately Suzaku spared his life for some unknown reasons due to the fact that he had a hard time acknowledging his attempts to save him. This led to events such as the exile of Zero since Suzaku didn't want Nunnally to share the same fate as Euphie. It is possibly indicated that Suzaku's views on Lelouch began to change but ever since Nina wanted to kill Zero, Suzaku couldn't forget what happened. But Suzaku didn't lose a lot of faith in Lelouch since he wanted to question his actions especially why he killed Euphie since there could have been another way. After realizing the truth, Suzaku possibly began to have a sudden change of views on Lelouch. Suzaku also hates Charles and Geass as the culprits behind Euphie's tragic actions. Euphemia is Cornelia's younger sister, and loves her sister very much, she left her throne to clean the name of her sister as the massacre princess. She partially succeeded, but Euphemia's name was only fully cleared to the world when Lelouch became Emperor, controlling her to commit genocide becoming just one among many crimes that the people of the world came to hate him for, as was his intention. Euphemia is Lelouch's younger sister, and was told by Lelouch that she was his first love shortly before her death at his hands due to him losing control of his Geass. Prior to the series, Lelouch, Nunnally and Euphemia would play together, and watch the stars together in Pendragon. Euphemia deeply missed Lelouch and Nunnally when they were sent into exile, and when they were announced dead when the war between Britannia and Japan happened. Eventually Euphemia then began to question who Zero is when the possibility of him having a grudge against the Britannian imperial family is revealed. The Island of the Gods episode also boasts strong innuendo about their relationship. When Zero confronts Euphemia a second time, she asked if he is Lelouch, to which he takes off his mask and reveals that he was alive to Euphemia, which causes her to have tears of joy seeing her long lost brother. Its revealed that she finds Lelouch's anger towards Britannia and the imperial family justified. Despite finding Lelouch's reason to become Zero, she however wishes that they could go back to being together. When she establishes the Special Administrative Zone of Japan, Lelouch goes against it. When he confronts her at the ceremony, she reveals she is doing it for Nunnally's sake and to protect Zero. Lelouch decides to agree with the zone, but when his Geass becomes permanent (with the order to kill all the Japanese accidentally) he then realizes that he has to kill Euphemia. As Lelouch shot her, he states that she was his first love. It was one of the greatest burdens and sins on his soul and something that he was never able to forgive himself for. Euphemia and Marrybell were close in the past along with the Vi Britannia siblings. At some point, Marrybell succeeds Euphemia as the second "Massacre Princess". Euphemia left a profound effect on Nina during her term as Sub-Viceroy of Area 11. Due to her intense fear toward the Elevens (Japanese people), Nina was deeply afraid of them. When Nina accidentally called a member of the Japanese Liberation Front an Eleven, the member was deeply angered. While Euphemia watched the event unfold as the member threatened Nina, her bodyguards tried to persuade her from interfering. When the member began to drag Nina away, Euphemia couldn't stand to watch this anymore and demanded the man to let Nina away. After Euphemia revealed her identify, she calmly asked Nina if she's okay. Unknown to Euphemia, her actions to save Nina left a lasting impression on Nina. Nina informed Milly about her desire to thank Euphemia for what she did back at the hotel. Her feelings toward Euphemia developed into an unhealthy obsession. When Nina discovered that Euphemia was at the Clovis Memorial Museum, she immediately rushed to the museum. When Nina tried to call out to Euphemia only to be tackled by the police for trespassing, Euphemia immediately recognized Nina from the hotel incident. She ordered the police to let go of Nina as she was a friend of hers, much to Nina's surprise. After taking Nina to her home and giving her a change of clothes, Nina informed Euphemia her gratitude for saving her. When Nina accidentally told Euphemia that she was a "goddess" to her, Euphemia accepts the thanks, but still feeling self-degrading, admits she is nothing. Nina rebukes this, but then says that there is nothing special about her, as she's not pretty and not royalty. Euphemia tries to say she's cute, but Nina denies this, causing Euphemia to realize they are alike in that they both hate themselves. Nina told Euphemia that Suzaku scared her (despite knowing that Suzaku isn't anything like the Elevens she had encountered before), and how she tried to overcome that barrier. She can't bring herself to hate Euphemia for her decision of making Suzaku her knight because she "needs" her. Nina's words caused Euphemia to realize what she can do for both her and Suzaku to overcome their burdens and fears. Euphemia told Nina that she was glad to befriend her and was grateful for their conversation. Their conversation also helped Nina as well. She was seen in a cheerful mood during the school festival. When Euphemia was discovered at the school festival, Nina was taken by surprise. She tried to reach to Euphemia in order to help her escape but failed. Although Nina was shocked by the declaration Euphemia delivered to the world, she tried to inform herself that if this is Euphemia's decision then she will her support her. Tragically, Euphemia's death at the hand of Zero caused Nina to become mentally unstable. She tried to avenge Euphemia during the Black Rebellion only to fail. Euphemia's brother, Schneizel, took notice of Nina's devotion to Euphemia and took her to a research lab in Dallas, Texas to become his chief in his Vogue research team. Schneizel tried to keep Nina stable by informing her how Euphemia would act and behave in public. Nina developed an intense hatred toward Zero for killing Euphemia and was determined to complete her research. This changed completely when Nina witnessed firsthand the destructive capabilities of her weapon. After learning that her creation caused the death of 25 million people during the 2nd Assault of the Tokyo Settlement, Nina was consumed with grief. She eventually helped Lelouch during the Zero Requiem by developing a countermeasure against her creation. Although Nina informed Lelouch that she will never forgive his role in Euphemia's death, she told him that she needed to find her own answer. As Nina walked away, Lelouch told himself that she was indeed a good person. Eventually, Nina let go of her obsession toward Euphemia and overcame her hatred/fear toward the Japanese people. After the death of Clovis, she soon takes over as the Governor General of Area 11 and meets Lelouch sooner as a temporary student in Ashford Academy. She shares the same fate as she did in the anime, where she had set up the Special Administrative Zone of Japan only to have it end in a disaster as she was accidentally Geassed by Lelouch to kill all the Japanese. Euphemia was later killed by Zero, who used her actions to stir up the Black Rebellion. In Nightmare of Nunnally, Euphemia becomes the Governor General after Clovis' death, and picks Suzaku Kururugi as her knight, dispatching him to assist a beleaguered Princess Cornelia in a three-way battle between Nunnally's Mark Nemo. When it is discovered that Nunnally is the pilot and is to be executed on orders of Rolo Vi Britannia, she recruits Suzaku and the Lancelot to disrupt the execution, where they are subsequently aided by Zero. In the ensuing Four-way battle (between Zero, Suzaku, Rolo and Alice), Nunnally is spirited away by Alice. When Emperor Charles zi Britannia abolishes the Holy Empire of Britannia for the Holy Nation of Eden Vital, Euphemia is arrested by Rolo along with Cornelia (and all other governors-general). She and Suzaku are rescued by Zero and the Kyoto House, and she becomes the 99th Empress of Britannia due to support by Kyoto House, the (now-imprisoned) Imperial Senate and Prime Minister Schneizel, as well as her sister Cornelia. She leads the Britannian army against the Emperor at the Sword of Akasha, but her forces are routed by the Knights of Round (who in NoN are essentially undead zombies). Fortunately, they were prevented from being annihilated due to the Knights' demise as a result of Charles' death. At the end of NoN, Euphemia frees all the numbered areas, trying her best to establish peace between these newly created nations. Euphemia plays the role of the White Queen in Code Geass: Nunnally in Wonderland. When the Queen of Hearts (Marianne vi Britannia) challenges Nunnally to a game of croquet, Euphemia appears alongside the White King (Cornelia Li Britannia) demanding to play as well, saying that she wants to make it so that croquet can be played by everyone. She even states that she wants to establish a Special Administrative Zone of Croquet. In this game, the player can prevent the special zone massacre by either overriding her Geass before she goes on the stage or brainwashing the crowd into forgetting what she said. It is also possible to romance her. In the ZEXIS route, Euphemia is revealed to be alive and stops Lelouch from Geassing Nunally. She has a falling out with Suzaku since she considers him a traitor for siding with Lelouch. Euphemia using her Geass ability? Euphemia seems to possess a Geass ability in the alternate story paths in the DS Game. This Geass ability puts people into a deep sleep/comatose state. The relationship between Euphemia and Suzaku somewhat resembles the relationship between Elie and Haru from Rave Master. Coincidently, those two are voiced by Michele Ruff and Yuri Lowenthal respectively. Euphemia shares the same voice actor with Kotori Monou from X/1999. Her relationship with Suzaku parallels to that of Kamui and Kotori as well. Their deaths are similar too since both are killed by their brothers sparking their lover's emotions. Euphemia died a month before her seventeenth birthday. (To Suzaku Kururugi) "Suzaku Kururugi. The truth is you and I... ah that is... you see... I hereby command you to love me. And in return, I will love you forever. Suzaku, I love your stubborness, and your kindness, and your strength. I love your sad eyes, your clumsiness, and the way you have trouble with cats. I love everything about you. So please, don't hate yourself!" "The stars haven't changed, have they? They were the same back then. Long ago, we all used to gaze up at the stars together... wouldn't it be wonderful if we could live like that again? I'd be so happy then. Can't we go back to that?" "It's not that I want an ideal country or great justice or anything complicated like that. I just want to see people smiling." Euphemia li Britannia as she appears early in the series. A close-up of Euphemia li Britannia. 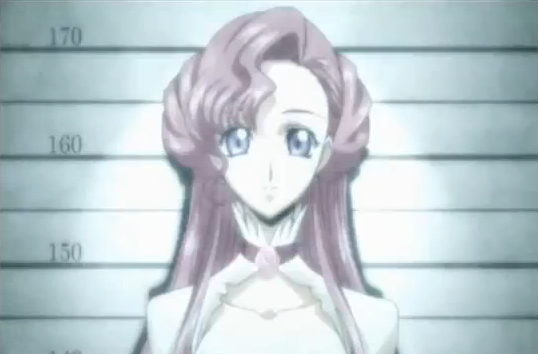 Euphemia as she appears later in the series. Euphemia in her childhood with child Lelouch, child Nunnally and Marianne. The last moments of Euphemia li Britannia. Euphemia under the influence of Lelouch's Geass.